Prior to the exhibition of the installation, sound recordings were made in the urban region surrounding the museum and logged on a map. A wide variety of sounds was registered, taken from residential areas, shopping centres, industrial suburbs as well as marshalling yards and so on. Although often characterized by its ordinary source, sometimes the less obvious was recorded by the use of contact microphones, close-up registrations and hydrophones. Accordingly, an impression of the local economic and social fabric was compiled in a sound library. The route of the sound gathering trips is being projected within the spaces of the museum. For this, Devens developed a scaled down stainless steel model of the building, filled with water. A stylus or probe follows a choreography through the water in the model, based upon the route. The recorded sounds, now put in a composition, is transmitted to the water by a tiny current to the tip of the stylus . Small receptors register the current which is amplified and transmitted to speakers in the real space of the museum: the position of the stylus in the model assigns the place in the museum where the sounds are heard. The auditive reality of contemporary people is therefore conserved in the museum’s tonality. 2012 'Mapping the landscape' Museum Van Bommel Van Dam, Venlo (NL). 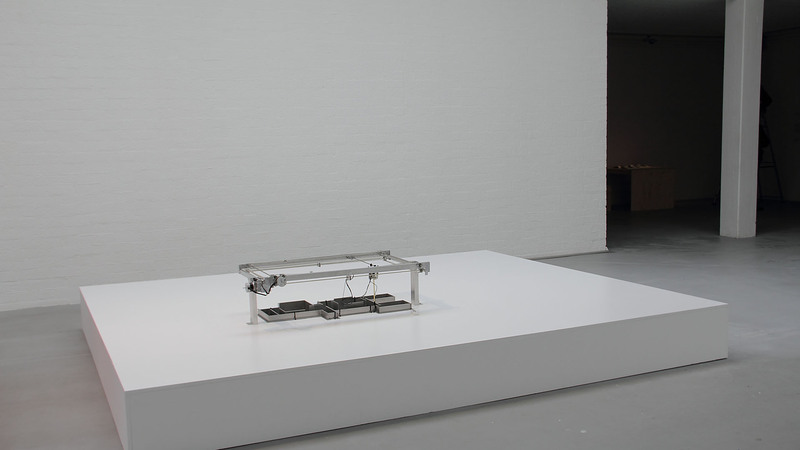 Stainless steel model, water, aluminium construction, stepper motors, Arduino, media player, 13 channel speaker system.